The 2018 Beijing Summit of the Forum on China-Africa Cooperation (FOCAC) was held in Beijing from September 3-4. Leaders of FOCAC’s African members attended the summit, and representatives of relevant regional organizations in Africa and international organizations also participated in related activities. What is the current status of China-Africa relations? What can be done to deepen mutual cooperation? We interviewed people who come from or have worked in African countries, and they in turn have shared their observations regarding China-Africa relations. China Focus: When we mention Chinese culture, what comes to mind? Le Dreau Stéphane: Chinese culture is an extremely dynamic culture, extremely friendly as well. But what is most fascinating about Chinese culture is the history of China, how it is an ancient culture, how fast the country has evolved and how it continues to evolve at such speed. 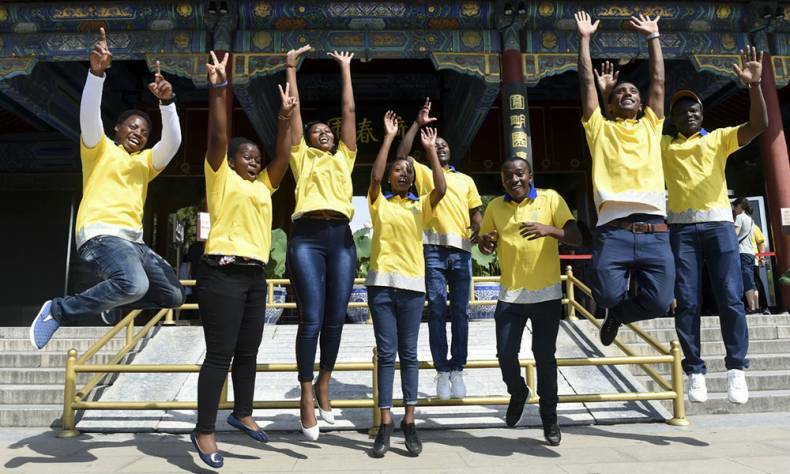 China Focus: Based on your experience living in Africa, how do you think Chinese culture is thought of in the African continent? Le Dreau Stéphane: I think African people are extremely open, extremely friendly, they go along with other people extremely well. When I was living there I made some very good friends, some excellent friends. And they get very close to your heart. It’s a culture that is extremely human and interesting. In China what you encounter is about the same thing. It’s a little bit more difficult to break the wall, but as long as you have lived in the country and make friends in the country, the culture is extremely similar. People in both China and Africa are very respectful and polite to one another, and they open their eyes toward outside cultures. So, it makes a good combination for cooperation between China and Africa. And it’s probably why you see that there is more and more Chinese investment in Africa. Africa is exporting goods to China as well. China Focus: Some in the Western media have accused China of trying to influence Africa culturally through movies for example. What are your thoughts regarding this accusation? Le Dreau Stéphane: I would say that I’m not sure movies influence the development of a country. Movies are there to entertain people, so any good movie will entertain a person. This is why I think people in every country today choose to watch Western movies, especially American movies because they enjoy being entertained. There are always movies that we go and see because they bring you something intellectual. And what is intellectual is opening your eyes to a different culture, to my previous point. I have no problem watching a Chinese movie, an African movie or a South American movie, because it can open my mind about the culture and the country. China Focus: Have you noticed a change in the image of China overseas over the course of the past several years? Le Dreau Stéphane: Yes of course. As you know, when I lived in Hong Kong about 15 years ago, I visited China Mainland quite frequently. Like I said, from the beginning, I have seen China develop with my eyes wide open. And I have seen how the country is developing and the speed at which the country is developing. I thought of China as a very strong economic power, so the perception of people from China, which was I would say, was regarded as an ancient culture in the past, has drastically changed. It’s becoming now a superpower, a super economic power, and people rely on Chinese products in their daily lives. So the perception of most people towards China has drastically evolved over the past 20 years. China Focus: In your experience, what aspects of Chinese culture are popular abroad? Le Dreau Stéphane: Food, as you know I’m personally a food lover and I love Chinese food. So of course food is certainly one. And a second thing is Chinese goods. I think that people, when they buy things, there is always this “Made in China” reference. This is where I think China is well-known. In addition, China has always been known for, I would say, traditional medicine. For example, when I visit Singapore, I often go to see a traditional Chinese medical doctor, who has even given me a natural plant to heal myself. Chinese traditional medicine is not valid for everything, but it’s well recognized as a way to treat people in a basic manner and is an aspect of Chinese culture that in my opinion is very well known. How can I put it, the idea of the self being of the person. Try to get some time for yourself, try to think for yourself, and develop a certain skill to be a little bit, I would say, less excited about what is happening in your life. Taking a step back before taking on too many challenges. China Focus: In your mind, how can one describe Chinese culture in three words? Le Dreau Stéphane: I would say extremely dynamic, extremely entrepreneurial and very open.